A new government intervention plan was adopted in early 2013 to protect public health against West Nile virus (WNV) infection, since WNV infection epidemiological activity had resumed in Québec in 2011 and 2012. This new plan establishes the strategy to be pursued for the years 2013 to 2015. The primary objective of the strategy adopted by public health authorities is to prevent the complications and human mortality related to WNV infection. Interventions are planned to combat the WNV vector, namely mosquitoes. The intervention plan also includes communication activities aimed at the general public and health care and social services network professionals. An integrated surveillance program was set up in 2013 to continue monitoring the situation. This program allows us to characterize WNV activity in Québec in humans and animals. 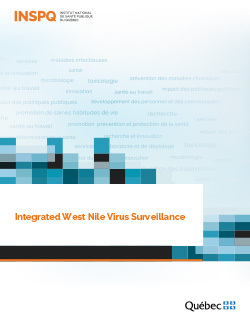 This analysis plan was prepared by the Institut national de santé publique du Québec's Groupe d'experts scientifiques sur le VNO [WNV scientific expert panel]. It is a working document that is continuously changing, according to the availability of information and needs. A preliminary version was accepted by the panel at their meeting on September 24, 2013. The analysis plan was then elaborated in connection with the WNV surveillance report for 2013.